First I'm way--way behind with this, but with that said I do have a new blog that I'm working on about my move to Hong Kong. Yes, that's right, I've moved to Hong Kong. So this was the last con I attended. I got to see old friends and made new ones, which is always a great thing. Some notable surprises were a fan from Germany that actually found me in the craziness that all conventions are. He was there with his lovely wife. Turns out he also owned a comic shop there. I was floored to hear that my little book made it out there. For those who were wondering who was that man that kept on hugging me throughout the convention, it was the man, Templeton. He made a promise to hug me until I left and he's a man of his word. My family came for the first time to this event and the kids had a blast. They enjoyed the cosplay and general fanfare. 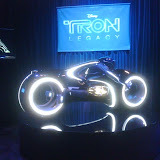 My oldest made me take her to the Tron lightcycle display and asked to watch the Green Lantern animated film First Flight. I've taught her well (heh). All right, on with the photo parade.